We have always loved celebrating Halloween and dressing up in different costumes. In addition to the above photo (our favorite Halloween photo of all time), you can take a look back at some of our other costume favorites on our previous post, Costumes Throughout the Years. We had every intention of getting all dressed up this year, but it did not happen as we spent the majority of this past weekend busily working on a big Halloween project. We feel great that we were able to spread holiday cheer in a different way this year. Be sure to check out our post on Wednesday, where we will unveil this special project to all of you. Tami’s plan was to be a flamingo this year. She made this adorable hot pink satin mask embellished with gold sequins and pink feathers around the eyes to complete her flamingo costume. Lauren has always loved peacocks, and so she decided to make her mask to resemble her favorite bird. She painted the abstract eye with white paint, embellished it with gold sequins, and finished it off with turquoise feathers making for a very artistic peacock mask. In keeping with the bird theme, we had thought Scott could be a penguin. When accompanied with a bow tie, this penguin mask (complete with painted features, feathers, and black sequins) would make for an amazing costume. Who knows, these special homemade masks might get worn on October 31st, but if not there’s always next year! Don’t forget to check out our post this Wednesday for a spooky surprise! Take simple pipe cleaners (or fun, sparkly ones like we did) and wrap them around the stick of a lollipop eight times to create the legs of a spider. Finish by hot gluing googly eyes to the head and voila! You have your own sparkly candy spider. Cut a bat wing out of black cardstock or even just construction paper. Trace the first bat wing backwards on the same paper to make the other wing. Hot glue wings and googly eyes to each Hershey bar and finish off with white construction paper fangs to create these adorable chocolate bats. It will be so much more fun for your Trick or Treaters to receive these spruced up treats on Halloween this year. If you have “tricked your treats” and have photos to share, send them our way. We would love to see them! When Scott and Lauren decided to remodel their guest bedroom (seen on our last post, Before and After Master Bedroom) to give themselves a bigger and better master bedroom, they knew that the first thing they had to incorporate was more closet space. They did not like the fact that some of their clothes were in the current master bedroom, some in the guest bedroom, and even some in the hall closet. Creating a compartmentalized closet that stretched the length of their new room was a must (It also doesn’t hurt that they got rid of some stuff)! Our dad Jackie, of Jackie Bitton Fine Woodworking, built this his and her’s closet with perfect spaces for shoes, sweaters, dresses, pants, and even their luggage. They could not believe that all of their stuff actually fit in there (well, except for Scott’s suits and a few jackets), freeing up the other closets in their condo for additional storage items and even allowing one area of the hall closet to be used for all of Lauren’s craft supplies! Adjustable shelves are perfect for shoes. Lauren adjusted them to fit the tallest pair of heels on each shelf and then color coordinated the shoes to find them easily. Even the empty space below the hanging items can be used. This space is perfect for folded shorts, jeans, large boot boxes, and even sunglass cases. The long hanging area on Lauren’s side is used for her long dresses. The spot under the short dresses and skirts is a perfect place for her laundry basket. Lauren’s purses are housed in the higher compartment above the dresses, making it easy to find the perfect bag for each outfit. Sweaters and items that are not used as often are the best things to tuck away behind the TV wall. It is very convenient for Scott to find his ties for work since they are hung in color order on this handy electric tie rack. The space between Scott’s tie rack and his laundry basket was a perfect place for his belts. It is easy to color coordinate your shirts when they are all the same (LOL). Scott chose to fold his jeans since he has so many. Stacking them in small piles by color or brand will make it easy to find what you are looking for. It has been a long process, but Scott and Lauren are so happy to be living in their newly remodeled space, and this closet is a major bonus! They no longer have to visit three different rooms just to get dressed for work in the morning, can find things easily, and love the look of the finished product. We are so excited to be celebrating our 150th post today with a project that is near and dear to our hearts! It was a long process, but Lauren and Scott’s master bedroom is finally complete. Although we posted about the master bathroom a few months ago, the finishing touches put into the master bedroom took a little extra time. Here is a look at the steps it took to get to where we are today: the Inspiration photos, the Construction, the Master Bathroom Remodel, and the before and after shots of this beautiful new retreat. When Lauren and Scott first moved into their condo in Brentwood, this room (the larger of their two bedrooms) was used as a guestroom and an office space for Scott. 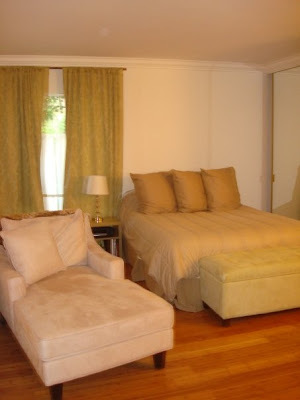 It has since been converted into their master bedroom with the addition of a pocket door leading to their newly remodeled bathroom, an extended closet, and a french door that opens up to their outside patio. Before remodeling, the layout of the room was off center and slightly awkward. 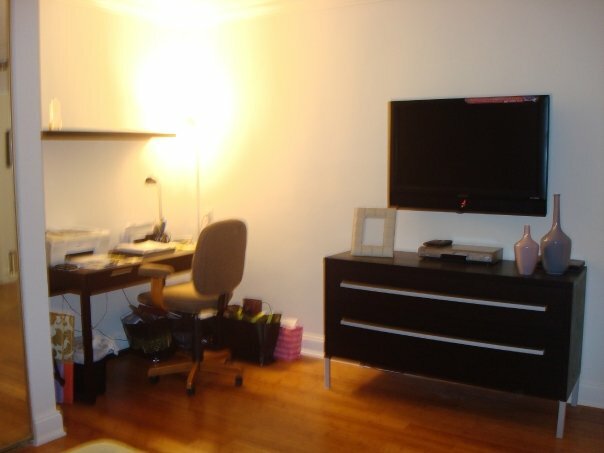 The niche in the corner of the room fit their desk well, but the rest of the furniture was mismatched and ill-fitting. Our dad Jackie, of Jackie Bitton Fine Woodworking, took on this special project working “Side by Side” with his daughter to create the room of her dreams. Their main focus was the layout of the room as they knew that once they reoriented the space the room would flow much better. This over-sized headboard in a soft grey linen, which was created by Lauren and our father, is the main focal point in the room. The two nightstands were designed to give a slightly traditional twist on a modern piece of furniture. These lamps from Z Gallerie were added to create balance, and the bedding was a wedding gift off their Bloomingdale’s registry. Silk throw pillows with a silver and white pattern complete the look. His and her’s nightstands are accessorized slightly different featuring masculine and feminine touches. Sheer linen draperies add a softness to the room while the chaise lounge gives the couple an extra place to relax in their space. They kept their room very neutral in different shades of grey and white in keeping with the calm atmosphere they were trying to create. These two wedding photos were among their favorites and serve as a special reminder of their big day. The closet wall (which we will be featuring in our next post) was probably the largest construction project in the room. Not only was the closet space extended to fit the length of the room, but this center wall was added as a space to hang Scott’s precious TV. The frosted glass closet doors were purchased at The Sliding Door Company, and when back-lit create a nice effect. Lauren designed this transitional dresser (which our father built) to house more clothing. The space above was the perfect size for Scott and Lauren’s wedding ketubah. The room was finished off nicely with crisp crown moldings, baseboards, and door frames. The already existing bamboo wood floors add a nice natural element to this overall glamorous space. As we said, this project is truly a special one for us. Lauren felt blessed to be able to design her own furniture for her space and even more lucky to share this experience with her dad. We actually think he enjoyed this project so much that he can’t wait for the next one. Every time he is over he lovingly asks, “What’s next?”. When attending birthday parties, we love to bring personalized handmade gifts for the birthday boy or girl. These handmade cards have become a favorite of ours lately, as we see them as the gift that keeps on giving. Our friends and family are always in need of cards and gift tags to spruce up a gift they bring to a party themselves. The overall 1920’s inspired theme for this card set was complete with rhinestones, buttons, ribbon, and scrapbook paper in peach and silver tones. We used vintage Vanity Fair postcards as our main material for this project. The adorable images of dancing flappers and dapper gentlemen gave each card a personal flair and reminded us of our friend Melissa who was to receive this gift. Five cards along with their envelopes and five matching gift tags fit nicely into this gift box. This gift was complete with over the top wrapping in the same color scheme as the gift itself. A large “M” was created on the top of the box as a way of making an ordinary gift box extraordinary. We know that Melissa will not have these cards forever as she will give them along with gifts of her own, but the box can be kept to hold other mementos. We topped it off with an over-sized white tulle bow and a handmade gift tag with another “M”. Presentation is key. Here are more ideas for making Handmade Card Gifts and even more from our previous posts. Whether making cards to add to a gift or as the gift itself the key is to keep your creative juices flowing. Use the birthday boy or girl as your inspiration for creating personalized cards and tags.